« Stepping up to the Daily Create Challenge! We’ve already had a brief taste when you watched last week part 2 of Everything is a Remix when we examined the idea of originality. As part of your understanding, you are tasked with reviewing at least two of the references listed below on the concept and analyzing at least 3 of the examples listed. Write up a blog post summarizing your understanding of remix, and explaining how the examples you watched demonstrated the form. Share your thoughts on whether this is a creative act and as well explore what it means for the entities that retain copyright over the media forms that are remixed. Include links and/or embeds of any media you reference. Tag your blog post RemixThis. Complete at least 7 stars of assignments from the Mashup Category of the assignment bank. Most of these require video editing and are are not trivial to complete. Start early! For this week, we are going to experiment with a new appliance in the ds106 cupboard–a remixer of exisiting ds106 assignments. Here is how it works… go to the new ds106 remixer site at http://remix.ds106.us/ The new tool we have created is called the Remix Generator. When it loads, it will randomly choose one of the hundreds of ds106 assignments; as well it will serve up one of what we call “Remix Cards” which is a certain twist or variation to apply to the assignment. Your task is to then interpret this as a new assignment- and do it. Not only that, we want you to look at the examples that were done for the original assignment, and use media from one of these as your starting point. 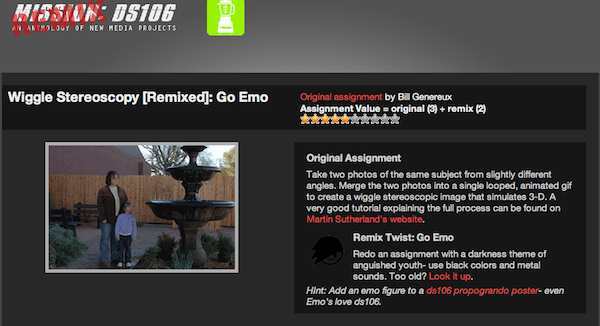 For example, one combination is combining the Wiggle Spectroscopy (visual assignment) with the Go Emo remix card – so the challenge there would be to create a wiggle visual that features an emo type character. To do this I might download the GIF created at http://www.generousworld.net/?p=101 and try to edit it to change a character. It’s tricky! (And some combinations may not even be possible!) We are not as interested in what fabulous creations you can make, but how you can write up your and justify your interpretation of the remix assignment. If the remix generator gives you something that does not make sense, just reload. Complete at least 2 daily creates this week!! Make sure you blog about them at the end of the week. If you have taken on the Daily Create Seven Day Challenge, there is an new mashup assignment for you! Your letter home this week should a video that incorporates some element of remix (maybe you can match your voice to a film clip?) We expect this to include at least three clips (these can be from your completed assignments or elsewhere) edited into the video of you talking about your week’s experiences. Also, like last week, make sure there is some context to your blog post when you post the video, it should make sense to explain what the video represents (e.g. an introduction to the video). You should also have links to the blog post that you reference in the video. All work is due Sunday, July 22 at Midnight. This entry was posted on Monday, July 16th, 2012 at 5:13 pm	and is filed under Announcements. You can follow any responses to this entry through the RSS 2.0 feed. Both comments and pings are currently closed.